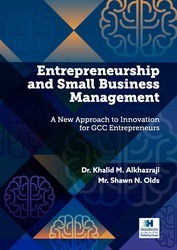 Instructor Resources: This eBook includes 20 powerpoint presentations for each chapter and a manual to Aid Instructor on the Entrepreneurship and Small Business Management: A new Approach to Innovation for GCC Entrepreneurs book. Entrepreneurship and Small Business Management: A new Approach to Innovation for GCC Entrepreneurs provides insight of the GCC business system and practices, discussion of the entrepreneurial and SMEs activities, cases of innovation and startups, overview of the challenges to create an innovative environment, and explains the steps that are needed to create a new venture. A conceptual framework for entrepreneurship and innovation development globally as well as specifically in the GCC. The GCC business system from a historical and economic perspective (Islam & Oil, GCC Trade Integration, Labor Markets and Demographics). The challenges facing innovation in small business in the GCC: Legal, Education, Culture, managerial development, corporate governance, and financing. The regulatory environment for small business (Obtaining a business license, approval of special requirements, IP, Etc). How to create a business plan. Definition of entrepreneurship: characteristics and qualities. Explanations of critical business functions to develop an enterprise.